The Outdoor Patio Table Set is ideal for enjoying a picnic, playing games or simply visiting on beautiful days. 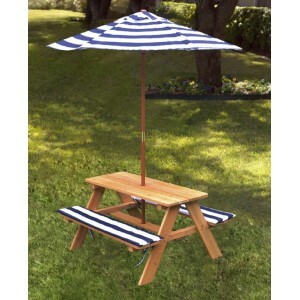 The umbrella offers shady relief from the summer sun and the padded benches are perfectly kid-sized. Constructed from weather-resistant wood with a beautiful clear stained finish, this set will look good for years to come.